With the new update of whatsapp for android, whatsapp finally added 8 tabs of new whatsapp emoji - Exclusive. In the previous version of whatsapp for android, users were be able to use only 5 tabs of whatsapp smileys but with the recent update of whatsapp 2.12.374, android users will be able to use 8 tabs of whatsapp emojis. Its really a top news today. The official whatsapp android app is not updated on the playstore. As you know whatsapp first upload beta version on their official website to check the user response first. So you can get the new whatsapp 2.12.374 emoji update version from their official website. Soon it will be available on playstore too. Valentine is coming soon and what more perfect gift whatsapp can give to their users. Now whatsapp users can use dozens of dozen's new whatsapp emojis to express their deep emotions and feelings. These emojis were only available for IOS 9.1 users till now. 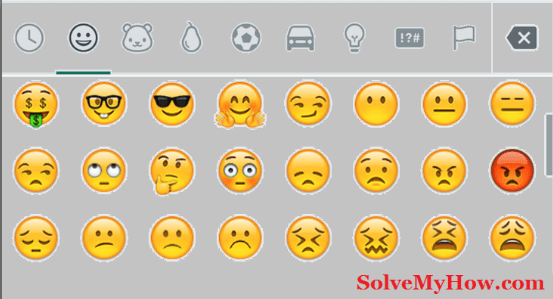 But with the recent whatsapp android update, android users can also take benefit of new whatsapp smileys. If you're an IOS or iPhone user then you can check mashable post about IOS new 9.1 emojis. After Facebook purchased whatsapp for $19 billion, its continuously bringing new changes day by day. Recently the new whatsapp update came in which android users were allow to add 256 group members in one group instead of 100. The previous version on whatsapp only allow 100 members. The next best update was when whatsapp officially announced that "Now whatsapp is totally free for lifetime". Recently company disclosed that they have 1 billion active users and 42 billion messages sent each day. Watch the whatsapp update video introducing 6 new cool features by indianexpress. You can download whatsapp 2.12.374 version from here. So this was all about whatsapp android update with new 8 tabs of emojis/smileys. Do you like this update ? Please write about it in the comment below. Don't forget to share this update with your social media friends on Facebook, Twitter and Google plus. You can also subscribe for SolveMyHow newsletter to get instant updates about whatsapp, android, iPhone tips and tricks right into your inbox !